WAHIAWA, OAHU (HawaiiNewsNow) - After four days of searching, authorities have located the 32-year-old missing hiker Justin Clark in the hills above Wahiawa. Honolulu Fire Department rescue crews resumed the search Saturday morning and were able to locate Clark around 4 p.m. According to officials, Clark began hiking Tuesday morning on the Schofield-Waikane Trail. Clark's mother became worried and texted her son when he never returned and missed a doctor's appointment. Clark replied and said he was injured but still able to move. The last reported contact with the hiker was a text message he sent on Tuesday at 4:15 p.m. 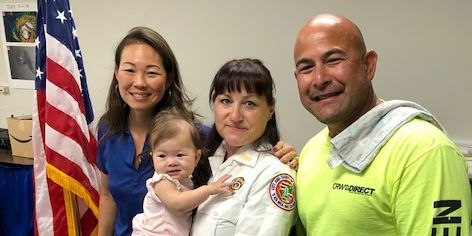 While most of Hawaii was celebrating Independence day, Clark and his family were celebrating their reunion as the fourth day of searching proved fruitful. Shortly after the rescue was made, Clark's mother, Shirley Seeger, expressed her enormous gratitude to the rescue crews who plucked her son from the woods with a helicopter. Crews brought Clark to the landing zone at Iliahi Elementary School where medics tended to his wounds. Fortunately, Clark left the woods with only a minor injury to his right ankle, some small scratches and a small case of dehydration. "He's very lucky. Statistically speaking, not many people make it to the point that he did and are found in good condition or alive." said Adam Gaines of the Maui Search and Rescue Team. Fire Captain Ian Ah Mook Sang says the search for Clark could have been expedited if he decided to call 911 when he got hurt. "I think if the hiker had called 911 on his initial day when he was injured we'd be able to use our enhanced 911 system to get a GPS location on his position." said Ah Mook Sang. Justin Clark, his family and the rescue crews who helped save the missing hiker all count their blessings and consider themselves lucky, knowing this story had a happy ending.